What a fantastic time I had today watching hundreds of raptors migrating into the Lower Rio Grande Valley of Texas. It was actually overwhelming at times to see so many hawks and vultures and other raptors filling the sky. This short video clip gives a small slice of this migration. Note: as many of these raptors were high up it is best to watch this in full screen mode. When I found this hawk I had no idea it was a Grey Hawk as this 1st year plumage is so different from adult plumage.As can be seen in the pic above this immature hawk was relaxed when I started photographing as it perched with one leg tucked up. Though I stayed in my car and stayed quiet to avoid disturbing the hawk the mechanical camera noise (all bells turned off) of my Canon 60d dslr camera alerted him and he looked right at me. I spotted this Peregrine Falcon this week in a town called San Juan here in the Lower Rio Grande Valley. I photographed this very bright Nashville Warbler at Frontera Audubon this week. It must have recently acquired this very bright plumage. Uncommon in the Rio Grande Valley, one or more Indigo Buntings have been seen in Hugh Ramsey Nature Park in Harlingen for the past month or so. I saw this adult male today as it enjoyed a bath even though it had to share it with a Northern Cardinal. Buff-bellied Hummingbirds such as the one below are fairly common residents in the Rio Grande Valley. An apparent pair of Long-billed Thrashers foraged together. 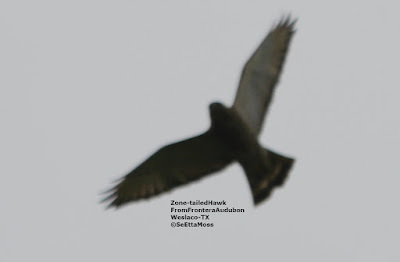 It took a week here in the Rio Grande Valley but I was able to spot a Zone-tailed Hawk as it flew near Frontera Audubon.